Some people thrive on change. Some try to avoid it. I recall a quote: The only thing that is constant in life is change. So… have you been seeing the number 5? 55? 555? Expect some changes in your life. 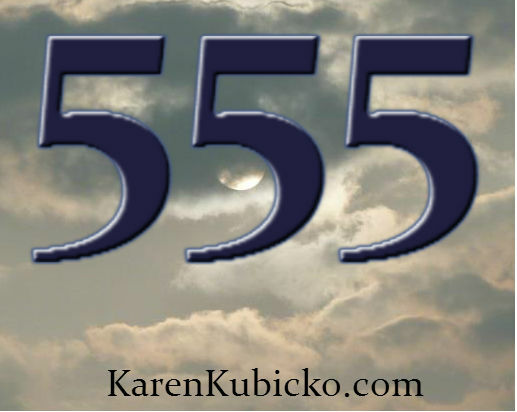 When I was about to make some major changes in my life, I saw 555 a lot. On the clock… in a random phone number… on a receipt… whew. When I first started seeing repeating numbers years ago, I thought I was going a little crazy. But now, I know that seeing numbers are signs that confirm how connected we are to the angels and our spirit guides. These physical messages from beyond have become a welcome ‘coincidence’ or ‘synchronicity’ in my life. So what does seeing 5’s mean? 5 means: “A significant change is occurring, always for the better. It’s a good idea to call upon Heaven for help with life changes. Another important thing to do, is to pay attention to what you are thinking about (or doing) at the time you see the 5’s. This will help you know understand the message more – plus it may give you insight on what the focus of your change may be. Remember, change can be a good, healthy, welcoming thing. This entry was posted in Inspiration, Metaphysical, Metaphysics, New Age, Relationships, science, Spirituality and tagged angel, change, Doreen Virtue, guardian angel, messages, numbers, positive, repeating, spirit guides, synchronicity. Bookmark the permalink. your quote is soooo true ! Love the angel numbers! And the other one I see so much lately is 222; kind of goes hand in hand with the 5’s and change. Thanks for a great informative post. Hello Words From the Moon, I will post on 222 and 333 next… I get a lot of people asking me for these numbers too! It is a fun reminder for sure! Thank you Connie… you just did though.. lol.